Serving all of Pasadena , Los Angeles and Southern California . Since 1979. At Novotny’s Estate Sales and Liquidation Services we have extensive knowledge of everything from antique to modern. Not only are we the estate sale professionals we are also antique dealers and interior decorators.We do it all. We are friendly professionals who have helped many families sell their belongings in an efficient and stress free manner. The stuff you’ve got is worth a lot! We have certified appraisers on our staff and we deal with antiques, fine art, antique jewelry, crystal, sterling, china, and just about everything you can imagine !! Relax, take a deep breath, and know that the contents of your home or business will be handled efficiently and professionally by Novotny’s Estate Sales and Liquidation Services. 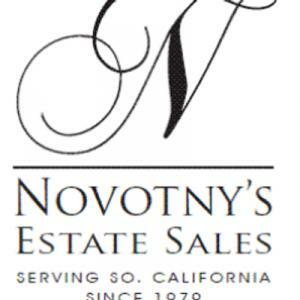 Novotny's Estate Sales are Pasadena and Los Angeles Premier estate liquidation specialists since 1979 . "We go the Extra Mile" for our client . We are commission based and only get paid upon our success. We are Insured and bonded. Call or email us first for a "FREE CONSULTATION" at info@NovotnysEstateSales.com or calling us at 626 577-9660 or 626 705.1904. Please join our our email list for all Upcoming Events and Estate Sales at www.NovotnysAntiques.com. PACKED house ! Burbank Estate Sale ..All has to GOOOOO !!! "One Day Only" Pasadena Estate Sale ..Monterey ! Pasadena Estate Sale in "Bungalow Heaven"
San Gabriel Estate Sale ..Up To 50 % OFF ..
La Canada Flintridge Estate Sale ..
Manhattan Beach Estate Sale .. ALL HAS TO GO .. End of a ERA !! Arcadia Estate Sale " Simply Amazing "
Glendale Traditional /Mid Century Estate Sale " One Day Only "
Westchester Bank Trust "One Day Only " Estate Sale..
__Arcadia Estate Sale ..This Weekend ___Sat.3/12 &Sun.3/13 9 am - 4pm _ Great Sale & Jam Packed !! Pasadena "One Day Only" Designer Estate/Warehouse Sale ..Great Deals !! Hi Shauna...I've been meaning to write a testimonial for the great job you did for us . Hope you are all doing well..
, clothing, memorabilia and hundreds of books! We felt that we could entrust Novotny's with the entire sale. ful people I've worked with...By the time they were finished it was like they were part of the family! As you know by now I signed and returned the acceptance letter for the estate sale Thanks for sending the check for the proceeds. I wanted to thank you both (and everyone else who was involved) for all your work making the estate sale happen You made it so easy, from my end at least, but I know you put in a lot of effort to make it a success. Shauna Novotny was very helpful setting up and conducting an estate sale for us in Sept. of 2010. We had numerous victorian antiques and furniture that she was able to advise us about in regards to value. She was very professional in all of her advice, suggestions, and especially her cleaning, minor repair work and setting up and conducting the sale. We were very pleased with the final outcome and can not recommend her highly enough. Our office had less than a month to vacate an eight thousand square foot home that we had been working out of for the past sixteen years. With so little time, we looked around and thought to ourselves, how on earth are we going to do this' Had it not been for Shauna Novotny and her team, there is no way we would have been able to tackle such a massive undertaking. Shauna and her team moved in quickly, helped us properly tag what office furniture was of value, recommended an amazing professional moving company to us, and most importantly, helped us dispose and liquidate the office furniture and equipment that they were unable to sell. Shauna and her staff are extremely knowledgeable when it comes to selling antiquities and they really do relieve the stress that comes with tackling an estate sale. We cannot recommend them highly enough They are one of the best at what they do.